In masonry, diaper usually refers to a brick pattern of repeating diamonds. A more general definition is a decorative application of brick, tiles or stone where different colors or shapes are used to create repeated geometric patterns. The term also applies to areas outside of architecture. In textiles a diaper is a repeated pattern of a small graphic. It was in textiles where the term was first applied. In the original Greek it means "two colors". Cloth from the Byzantine Empire made its way westward and the original Greek pronunciation was corrupted into the word "diaper". Nobility started using it as a background cloth for their shield decorations and it made its way into the world of heraldry. Eventually the patterns were copied into other media other than textiles. 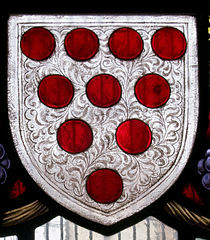 When applied to heraldic shields the term is no longer confined to geometric shapes, but the pattern must form a background and not be confused with the foreground or charge devices. There is a specific heraldic term for diamond shapes. Diamonds could form a damond pattern, but it they were large diamonds they were called lozenges and formed part of the regulated design of the coat of arms. In the example on the right the diaper is the black on white arabesque pattern, not the red dots. When diamonds are formed by bricks the diamonds are large, and it would seem that lozenge would be more descriptive but for some unknown reason those in the building trades refer to this as a diaper. When used in architecture the patterns formed can relieve large unadorned areas. If the pattern is repeated throughout a wall, the pattern can give a texture to the wall. This will create interest, and may also make the windows, doors and other physical breaks in the wall stand out more. It is a technique more readily applied with smaller bricks and tiles, rather than large blocks, and it is best enjoyed from a distance. Typically the pattern is made with brick of a different color. 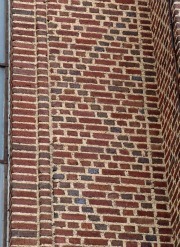 The pattern can also be formed by varying the face of the bricks. A pattern of headers in a background of stretchers may provide sufficient contrast to allow the pattern to show. 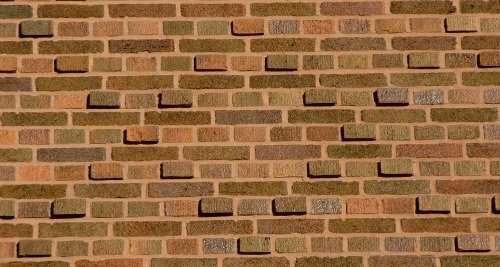 In some cases patterns are formed by offsetting the face of the pattern bricks so that they are not flush to the wall. Whether raised or indented the difference in depth creates strong shadow lines which will reveal the pattern. It is rarely used in modern construction in the U.S., but it may be making a comeback. It adds to the costs of construction labor, and, in some cases, construction materials. Still, it generally adds to the aesthetic appeal of a building, and thus its value. A different use of the term applies to Gothic construction where a series of repetitive carvings of a single device might fill an otherwise blank wall. The same effect can be created with three-dimensional cast tiles. 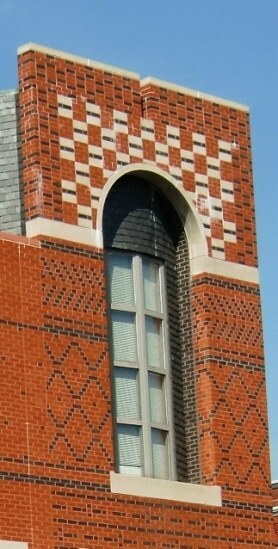 The difference between the brick diapering discussed above and this technique is that in the Gothic diapering each tile would form a pattern. With the bricks it takes a series of bricks to form a pattern. 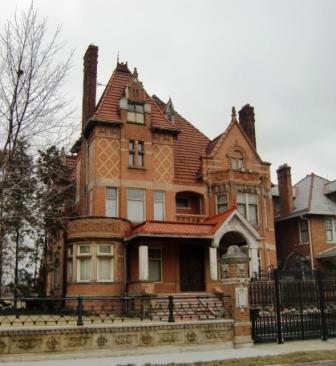 The diapering on this home in Columbus, Ohio occupies the one section of wall large enough to display the rather larger pattern. In Washington, D.C. a very modern version of a brick townhouse relies on decorative brick patterns for that wow! factor. Diapering this chimney adds interest and creates some contrast to the dominant red.